I’ve always found that the best zoo bird keepers have had strong roots in private aviculture. This makes sense – after all, birds were being kept as pets for thousands of years; zoos are a relatively new on the scene by comparison. On a recent visit to the Bronx Zoo, I was reminded of how many birds have found favor in both public and private collections. Following are a few of my favorites. Most of the birds covered here require large enclosures, and are most often kept by advanced hobbyists with outdoor aviaries. However, all are feasible to keep and breed, should this be your long term goal. In any event, enjoy…and don’t forget to watch for other such birds on your next zoo visit. Perhaps the world’s most recognizable bird, South America’s toco toucan makes a delightful pet. Toucans tame fairly easily, and I have found even parent-raised birds to be quite curious and very steady around people…the fellow in the accompanying photo, owned by a friend, will cuddle up to just about anyone! Captive-bred toucans are readily available, and their quaint looks and confiding ways temp many unprepared buyers. 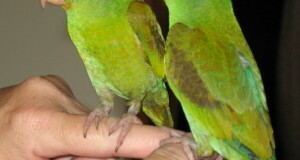 Tocos are, however, extremely active and spend very little time on the ground…they need a long, high aviary and will languish in a typical cage. Their bright colors belie a predatory streak…those I have cared for spent a good deal of time catching the geckos and treefrogs that lived within their aviary. Captives need a good bit of cooked meat and an occasional mouse, along with a wide variety of fruits and berries. We find among the family Phasianidae some of the most gorgeously colored of all birds, and it is small wonder that many are aviary favorites. From the diminutive button quail to the ever-popular golden pheasant, there is a species to fit nearly every bird fancier’s means. Although the Indian peafowl is often considered to be the most spectacular of the group, in my opinion that title belongs to Southeast Asia’s crested argus pheasant. Unknown outside of their forest homes until collected by famous bird man Jean Delacour and brought to Europe in 1923, the crested argus sports the bird world’s longest feathers. Those in the center of a male’s tail can top 80 inches in length. 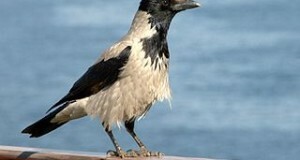 The related Great argus (pictured here) was established in private aviculture a bit earlier than the crested, and by the late 1800’s was being bred in Europe. Captives require huge, undisturbed, thickly-planted aviaries. Unlike most pheasants, they are quite sensitive to the cold. I was privileged to see the amazing courtship display of a male at the Bronx Zoo, but unfortunately the pair did not breed during my tenure there. This tiny relative of the argus is my favorite pheasant. The male, his head capped by hair-like bristles, is so differently-colored than the female that the two appear to be of different species. Both, however, are gorgeous. Hailing from the humid forests of the Malay Peninsula, Borneo and Sumatra, roulrouls become quite tame in captivity. They require a warm, well-planted cage and a varied diet of insects, fruit and boiled rice. Oddly, for a pheasant, they refuse grain. The male is also very “un-pheasant-like” during the breeding season – helping to build the unusual domed nest and often leading the chicks back to the hen for brooding. 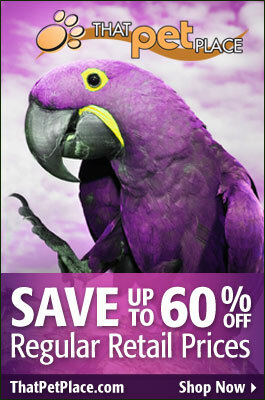 The glossy purple plumage of this spectacular West African native is hard to describe in words. Turacos of all types are far more popular in private collections in the UK than in the USA, but that situation is changing slowly. Aviculturists are drawn to their vibrant colors and amusing antics (they hop and crash about in a most unusual manner), but their space requirements are somewhat daunting – a pair (they do far better in pairs) requires an aviary of approximately 15-20 ft. x 10 ft. x 10 ft.
Violaceous turacos subsist largely upon fruit, with figs being a much favored and necessary food. Hand raised birds often become unusually aggressive (please see article below). Weavers construct the most elaborately-woven nests of any bird…the opportunity to watch the construction process alone makes them worthwhile captives. The brilliantly-colored Taveta golden weaver will use only long blades of green grass as a nesting material, and much prefers stripping these from living plants over picking them off the floor. Those I have kept exploded into action when I placed freshly-dug clumps of beach grass before them, but disdained grass clippings. The Taveta golden weaver (pictured here) is found only along the border of southern Kenya and northeastern Tanzania, and is not often seen in private collections. Several equally interesting relatives, such as the masked and African golden weaver are, however, regularly bred in captivity. I enjoy seeing Amazons in aviaries and zoo exhibits, where they can indulge their abundant energies so fully. Those not ready for the aforementioned species but interested in aviary construction should seriously consider Amazons or, indeed, any parrot. Restricted to the Bahamas, Cuba and the Cayman islands, Cuban Amazons are threatened throughout much of their range. Fortunately, they breed well in captivity and have responded favorably to the provision of artificial nest boxes in Cuba. Interestingly, the population on Abaco in the Bahamas nest below-ground, in naturally occurring limestone burrows. So situated, the nests are safe from the frequent fires that ravage their habitat. Caring for beautiful, exotic birds in captivity does have its dangers. For a glimpse at the perils involved in working with a somewhat unfriendly turaco, please see Introducing the Turacos (Family Musophagidae), With Notes on an Unusual Individual. Hello Thomas, Frank Indiviglio here. Thanks for your interest and the kind words; I am really enjoying your photos of pheasants and exotic fowl. Hope to hear from you in the future.